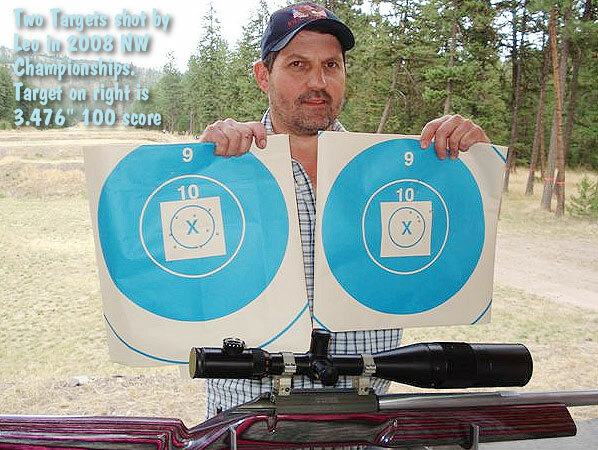 Montana 1K benchrest shooter Leo Anderson has set a pair of astounding multi-match Light Gun Score Agg records. These are “records for the ages”. This season, Leo’s 6-match Score Aggregate was 99.5 (99,99,99,100,100,100), while his 10-match Score Aggregate was 96.8 (84,94,95,98,99,99,99,100,100,100). That’s amazing consistency. Given how hard it is to shoot a single 100 score at 1000 yards, Leo’s Aggs are jaw-dropping. It will be a long time before these Agg records are broken (if they ever are). Leo set his 99.5 (6-match) and 96.8 (10-match) records shooting a 17-lb rifle chambered for the 6mm Dasher. The Lawrence barrel was chambered by Montana gunsmith John King and Leo did the stock work himself (starting with a Shehane MBR Tracker). The 29.5″, 5-groove, 0.237″ land, HV-counter barrel was crafted by Lawrence Barrels. Based in Lewiston, Montana, Lawrence Barrels currently makes mostly AR barrels, but Leo says they make great cut-rifled tubes: “I currently have Lawrence barrels on both my Light Gun and my Heavy Gun. These Lawrence barrels both shoot great. I think they are the equal of the best examples from top barrel-makers such as Krieger and Bartlein.” Leo has tried straight-contour barrels, but he prefers some taper (similar to a Krieger #17 contour): “In my experience, tapered barrels seem to shoot better, at least in a 17-pounder. The gun is less nose-heavy and tracks better.” The barrel on Leo’s record-setting Light Gun currently has about 900 rounds through it. While many top 6mmBR and Dasher shooters use Varget or Reloder 15, Leo prefers Hodgdon H4895, which has a slightly faster burn rate. Leo tells us: “Right now, the H4895 and CCI combo is giving the best accuracy, and it’s a clean combination. I’ve shot a lot of Reloder 15, but the H4895 burns so much cleaner.” Leo’s load is running around 3050 fps, but “he’s not too concerned with what the chronograph says — when we tune our loads we go by what shows up on the target.” Leo is loading a bit more than 32 grains of H4895. (Editor’s NOTE: This load is for fully fire-formed Dasher cases ONLY. It is NOT safe to use in a 6mmbr with 105s.) Leo’s favorite projectiles are the “thin-jacket” Berger 105gr VLDs, pointed with a Whidden pointing tool. Leo turns his necks with a K&M neck turner. To save on barrel life, Leo fire-forms his brass using a separate barrel. He prepares the brass with a false shoulder, then fires the cases loaded with pistol powder, cream of wheat and low-density plug in the end. He tried forming case with pistol powder alone, but that required much more powder and didn’t produce results as good as the cream of wheat method. Leo tells us that you need a great-tracking rig to be competitive in the 1K game these days: “Some guys are getting 10 shots downrange in 20 seconds or less. It takes me about 30 seconds.” To shoot that fast, the gun needs to track perfectly so you can just slide it back and stay on target. “If you want to shoot fast, everything’s got to be working right — and your stock really needs to track well. If you’re chasing the knobs on your rest, you’re not getting [your bullets] down range.” Leo says the stock’s geometry must be “near perfect” in order for the gun to come back to the same spot shot after shot. 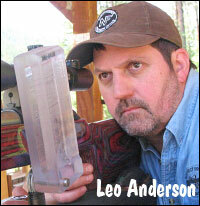 Leo Anderson’s Advice for New Long-Range Shooters. 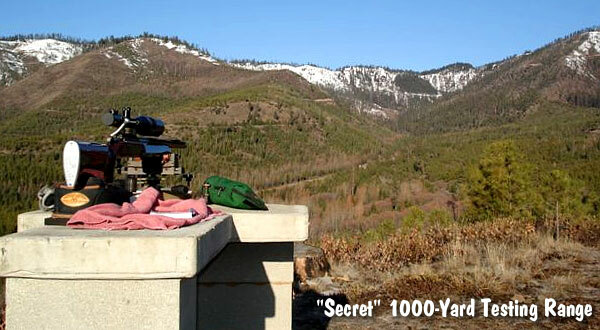 Leo reports: “Here’s our ‘secret’ 1000-yard range out in the sticks where we do some spring tuning”. Share the post "Leo Anderson Smashes 1000-Yard Score Aggregate Records"
With top-quality cartridge brass approaching $1.00 per case, it’s more important than ever to get maximum life from your match brass. Annealing can extend the useful life of your brass, and ultrasonic cleaning allows you to eliminate carbon build-up inside cases that have been fired numerous times. You can certainly do annealing and ultrasonic cleaning yourself, but to get the best (and most consistent) results, you’ll need to invest in quality equipment and spend a good deal of time and effort learning how to use it properly. Likewise, turning case necks requires expensive tools, and it takes time and practice before you’ll get perfectly-turned necks. If you don’t have the resources to purchase annealing and ultrasonic cleaning machines, or if you don’t have the time to neck-turn hundreds of cases — don’t fret, there is an affordable option. 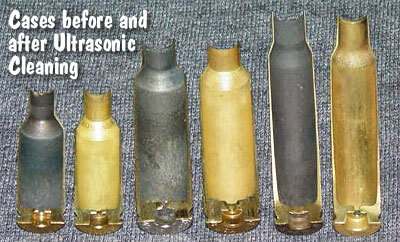 DJsBrass.com, run by benchrest shooter Darrell Jones, offers annealing, ultrasonic cleaning, neck-turning, and complete brass prep services (including OAL trimming) at very reasonable rates. Darrell will anneal 100 cases for $15, and he’ll neck-turn your cases (any caliber), starting at $30.00 per hundred. Even if you’re a skilled neck-turner, if you just acquired a new caliber, it might make sense to send the work to Darrell, instead of purchasing new expander mandrels and turning arbors. 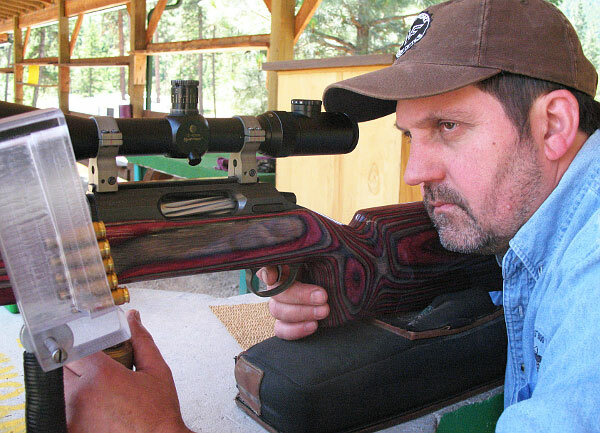 Do you shoot an “improved” short-necked wildcat like the 6mm Dasher? Want your fire-forming to go without a hitch? Darrell can take your parent brass and create a false shoulder so you get a good crush fit in the chamber. If you’re running a tight-necked chamber he can create a false shoulder AND turn the top half of the neck to fit your chamber. In the video below, Darrell explains the wide variety of brass restoration services he offers. Darrell says he can “bring your brass back to life” and we have found that to be true. We had some 6mmBR brass with no-turn necks that started to lose their “competitive edge” after just 7-8 loadings. The neck tension had become inconsistent from case to case, and bullet seating force (measured with a gauge-equipped K&M arbor press) varied widely. We were seeing unexplained flyers, and ES had nearly doubled compared to when the brass was fresh. Annealing the cases really made a difference. The neck tension was much more consistent and bullets seated more uniformly with less “spiking” of seating force. Paying $15 for annealing is a lot cheaper than buying a new box of brass for $80.00 or more! Ultrasonic Cleaning, Check for split necks, Anneal case necks. Uniform primer pockets, Chamfer, Ultrasonic cleaning/polishing, Anneal case necks. Removes carbon buildup to restore critical bullet clearance requirements. Cost: $15.00 + flat rate USPS actual shipping. *Add USPS flat-rate return shipping. Call (205) 461-4680 for quotes on miscellaneous, military bulk brass or high volume discount. Note: Prices subject to change. Share the post "Revive Your Brass with DJ’s Brass Service & Restoration"
The two-day 2011 Creedmoor Nationals for Black Powder rifles concludes today in Raton, NM. Many of the nation’s top black powder shooters are vying for the historic “Castle” trophy at the Whittington Center Range. Today’s course of fire is identical to Sunday’s — ten shots at each of three distances: 800, 900 and 1,000 yards. Weather was reasonably stable on Sunday, 17 July, but thunderstorms are predicted for this afternoon. The Creedmoor Nationals’ match history dates back to the 19th century with the purchase of the Creed Farm in Long Island, New York. A long range black powder match between the United States and Ireland at the brand new Creedmoor range drew a significant amount of attention to the shooting sports and drew eventually drew its name from the NRA’s range. The 2011 championship currently being conducted at the Whittington Center is based on the original course of fire in keeping with the tradition of the match. 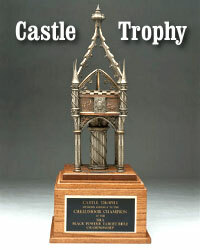 The Castle Trophy was first awarded to the 25th Lanarkshire Volunteers by Lord Elcho for their win over England and Ireland in a shooting match in 1871. The trophy was used as a prize at Creedmoor matches over the next couple of years. A noted inscription on the trophy reads: “Overall winners National Rifle Association of America 2nd Round” April 25, 1873. 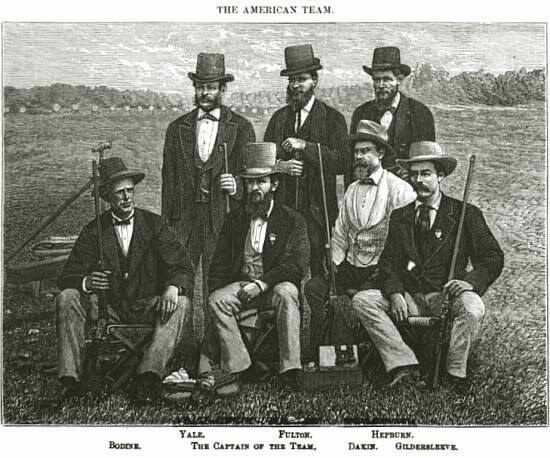 To honor the victors in the famous Creedmoor 1874 challenge match the USA and Ireland, this trophy was given to Colonel John Bodine of the United States of America Team. Story and photos by KJillson courtesy of the NRA Blog. Share the post "Creedmoor Black Powder LR Nationals at Whittington Center"